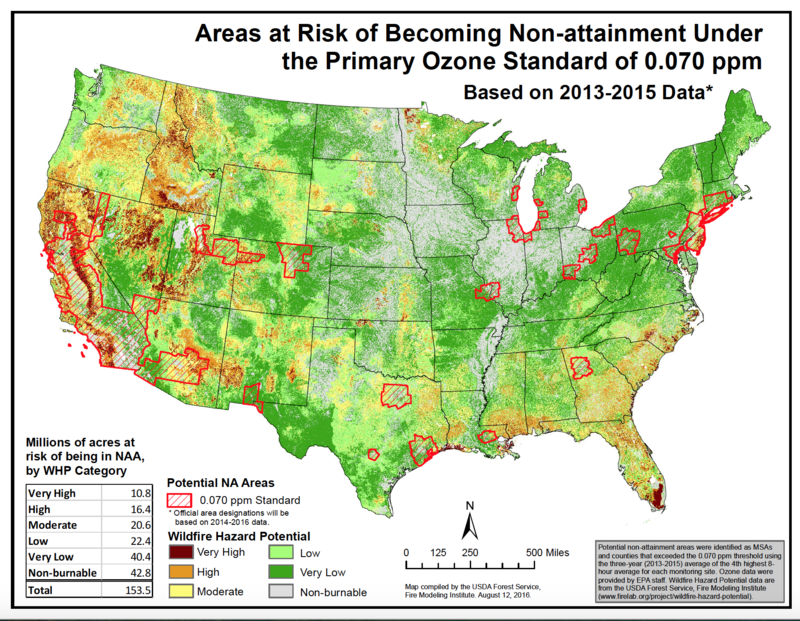 In October 2015 the EPA strengthened the National Ambient Air Quality Standards for ozone to 70 parts per billion. This new standard will have implications for the wildland fire community. This page highlights regulatory information from the EPA, maps of potential non-attainment areas, testimonies, and the latest reports and research collected by the NWCG Smoke Committee. NOTE: Official EPA designation for non-attainment will be based on 2014-2016 monitoring data. Deterministic and Empirical Assessment of Smoke's Contribution to Ozone (DEASCO3): 2014 Joint Fire Sciences Program Final Report for Project # 11-1-6-6, by Moore et al. Large Wildfire Trends in the Western United States. 2014. Dennison, PE, Brewer, SC, Arnold, JD, and Moritz, MA. Geophysical Research Letters Vol. 41 (8) pgs. 2928-2933. Western Region Air Partnership (WRAP) West-side Jump-start Air Quality Modeling Study (WestJumpAQMS). 2013 Final Report. Other WestJump materials on available on the WRAP WestJumAQMS webpage.